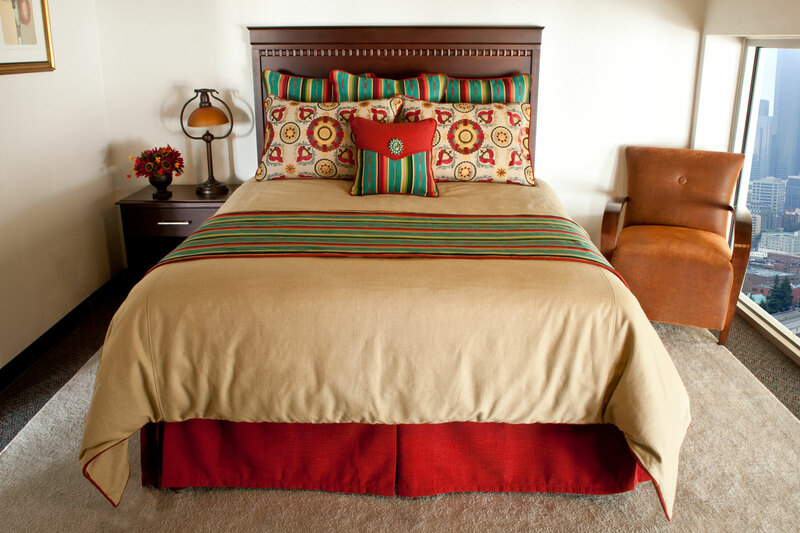 Silverado Home has been designing and manufacturing luxury bedding and home accessories for over 33 years. Our 16,000 square foot headquarters is located in the high desert community of Albuquerque, New Mexico, and our products are available across North America. We are a vertically integrated company, managing all aspects of the supply chain, including product design and development, in-house manufacturing, quality assurance, packaging, shipping and distribution. Since we control all these aspects, we are able to customize an eclectic array of products using a broad variety of fabrics and embellishments. We specialize in a variety of styles—Western, Ranch, Lodge, Southwestern, Old World and Tuscany—and countless more are available. Let us help you bring that elegant and timeless style to your customers, or to your home… We have recently introduced Silverado Studio as the premier resource for all your hospitality needs. We have the ability to supply hotels, restaurants, corporate environments, health care facilities, public spaces, and private residences with items including shams, designer pillows, bedding sets, duvet covers and comforters, upholstered furniture, drapery hardware and curtain panels, trims and fabrics, inserts, and more. Because our extensive library houses thousands of luxury fabrics, wall coverings, vinyl, decorative accessories, and much more, we are the largest Design Center in the Southwest. Use our information/contact page or check out our Facebook for additional details about where to find Silverado Home products.